The free radical theory of aging was first proposed by Harman . 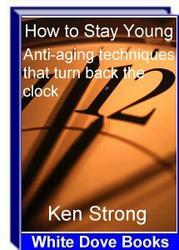 This theory essentially implies that biological aging is a result of the production of increased levels of ROS. The theory maintains that the normal respiratory chain function of the mitochondria results in sustained ROS production throughout an organism's life span, resulting in an accumulation of ROS-induced damage . It has been proposed that ROS of mitochondrial origin, when produced consistently over time, can cause accumulation of mitochondrial DNA (mtDNA) mutations, potentially leading to deterioration of the respiratory chain function. This can lead to even greater production of ROS because of disturbed electron flow  and, hence, a vicious cycle of ROS production can be established. Strong genetic evidence points to a role for the respiratory chain of the mitochondrion in controlling how quickly an organism ages. Studies in Caenorhabditis elegans (C. elegans) have shown that mutations in the CLK1 protein that is responsible for the final step in the synthesis of a critical transporter of electrons between complexes I/II and III lead to a 50% increase in life span , In fact, disruption of any essential step of the biosynthesis pathway of ubiquinone increases life span and decreases ROS production . Using RNAi technology, it has been shown that C. elegans displays a tenfold overrepresentation of mitochondrial genes, particularly involving complexes I, III, and IV subunits, among genes whose inhibition extends life span . The oxidative stress theory has been further substantiated in a number of model organisms where the supplementation or depletion of ROS-scavengers has either increased or decreased life span, respectively . A simple test of the involvement of ROS in aging organisms involves administration of antioxidants. A large number of studies have examined the efficacy of administration of antioxidants to aging organisms and how this affects longevity. Supplementation with vitamin E significantly increases the life span in nematodes , Paramecia , and diphtheria Zapronius paravittiger , It has also been shown in Podospora anserine that glutathione (GSH) addition increases lifespan by 13% and also strongly reduces the formation of end products of ROS-induced lipid damage . and approximately a 34% increase in life expectancy . The overexpression of Cu, Zn SOD in motorneurons of Drosophila also resulted in a 40% increase in life span . Caloric restriction can substantially increase life span and cause decreased ROS production along with increasing the expression of antioxidant defenses , Aging is thus characterized by an increase in oxidative stress concordant with a decrease in antioxidant capacity. Higher levels of ROS are found in aged tissue  and these ROS can irreparably damage cellular macromolecules, such as DNA, polyunsaturated fatty acids, and proteins [41-43]. Indeed, aging has been associated with increased levels of oxidative modifications of proteins [36, 44, 45], as well as increased lipid peroxidation products , and 8-hydroxydeoxyguanosine DNA-adduct formation . Although the free radical theory of aging still remains the most widely accepted theory of aging, it has recently come under scrutiny because a series of studies using mouse transgenic and null mutations models for proteins such as MnSOD, thioredoxin 2, and CAT have not substantiated the role of ROS modulation in altering life span expectancy [48, 49] .